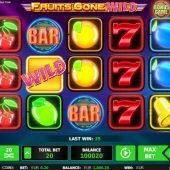 Fruits Gone Wild slot is Stake Logic's interpretation of the popular stacked gems and fruits style, found on games such as Netent's ubiquitous Starburst or Nextgen's Starmania. As Stake Logic are part of Greentube (Novomatic) you may expect quite a volatile slot here especially seeing the basic reels and symbols consisting of fruits similar to Novo's extremely volatile Power Stars game, but that isn't the case as we shall see. The graphics are simple and are set over a plain blue moving background and the sounds are certainly reminiscent of the dawn of video games back in the 1980's! So if these fruits have gone wild will our money be gone just as quickly? 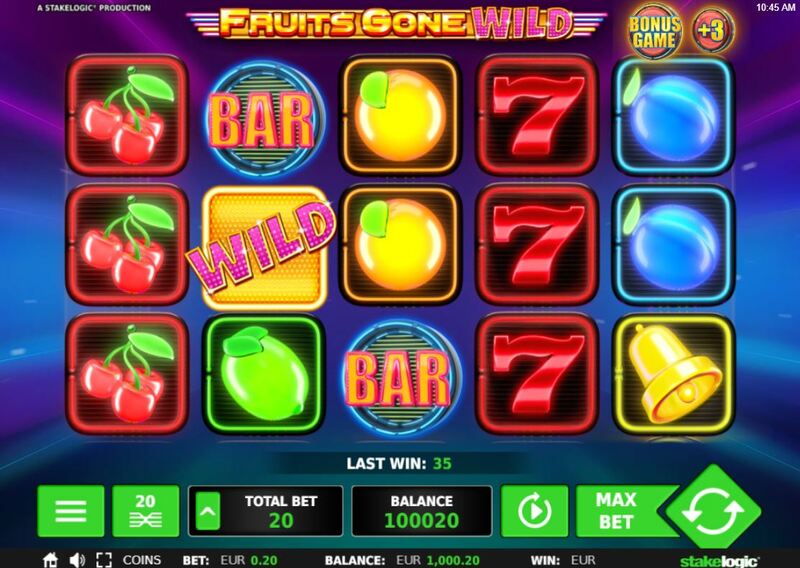 Fruits Gone Wild slot is an exceeding simple slot but does have a bonus round and an interesting use for those annoying 2-scatter 'heartstopper' spins which tend to grate with the player. All the symbols appear stacked and you have 20 paying lines over 5 reels of 3 rows each. Stars will pay 50x bet for a full line of 5-of-a-kind, Bars or Red 7's 10x, Bells 7.5x, Grapes 4x, Plums 3x, Oranges 2x and finally Lemon or Cherry 1x for the full line. Wilds don't actually appear on the reels but on every spin 1 to 3 are added to the grid in random positions before the reels stop. Despite this you can get a Wildline which pays 50x bet the same as the top-paying Star because randomly the Wilds added may turn into 2x2 block Wilds. You may also notice a 'Spin Bin' above reel 5 which is part of the bonus trigger. We need 3 bonus scatters on reels 1, 3 and 5 to trigger 5 free games. Now in the event you only see any 2 of these scatters you will get 1 spin added to the Bin, up to a maximum 20. When you trigger the bonus with all 3 scatters the accumulated spins in the Bin are added to award a maximum of 25. You will also get 5 extra spins for a retrigger and like Break Da Bank Again every single scatter adds 1 extra spin, so this round can go on for quite a while! The Wilds tend to be a little more generous too in these spins.